Whether you have a small room, or a large data center, the Sensaphone IMS-4000 System provides complete monitoring for your computer facility. It is designed to monitor your entire infrastructure, which includes the environment, the physical security, and the network operation. The Sensaphone IMS-4000 system is a stand alone infrastructure monitoring system with an integrated voice and modem, an internal UPS, flash-disk storage, and a web server, in a simple-to-install 1U rackmountable package. From the wide array of its plug-and-play monitoring devices to its sophisticated software, the IMS-4000 is a complete, flexible, integrated system. Monitor critical environmental conditions such as Temperature, Humidity, Smoke, Sound Level, Motion, Water, Intrusion, and Power Outages with the IMS-4000 Host and Node. Each Host and Node unit supports up to eight Environmental Sensors. When a sensor exceeds the threshold you configure— high temperature for example—you are notified by the IMS-4000 about the condition. Lights on the face of the IMS Host instantly reveal any outstanding problems. With sound level monitoring you can be notified if an audible alarm goes off, and you can remotely listen in, via the Host unit, to the server room to assess the situation yourself at any time. The IMS-4000 monitors IP Devices through pinging and port availability. When a network component becomes unavailable, the IMS-4000 notifies you about which IP device is unavailable. You can monitor the status of network links, routers, printers and servers—any device which has an IP address. Each IMS-4000 Host and Node can monitor up to 64 devices. When a device does not respond to the IMS query, it contacts you immediately to alert you to the situation. 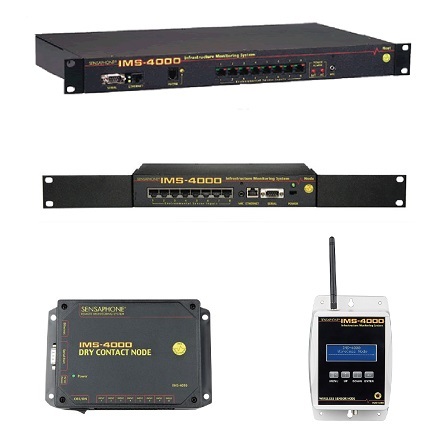 When a problem occurs in your network, the IMS-4000 will find you and notify you of the problem no matter where you are. Multiple communication interfaces— Ethernet port and standard telephone interface— guarantee that you get the message. You receive early notification before a problem turns into a disaster. The integrated modem / voice interface of the IMS-4000 Host means network events and environmental problems are sent to you in your own voice. When all you have is a phone, you will still know what’s going on in your network. You get the message fast. Curious about your network? You can always obtain status information about your infrastructure—anytime, anywhere. Call into the IMS-4000 using your computer’s standard dial-up networking. The IMS Console software operates the same remotely as it does locally for complete management and control of your IMS system. If you’re not near a computer, then just pick up any phone and call into the IMS-4000: It will tell you in a real voice report the status of all conditions.